Never buy boxed brownie mix again! So simple, so easy. Not just frugal but cuts out the unknown ingredients. Brownie Mix $0.30 /mix. 1 Cup Sugar, 1/2 Cup Flour, 1/3 Cup Cocoa, 1/4 tsp Salt, 1/4 tsp Baking Powder. Add: 2 Eggs, 1/2 Cup Vegetable Oil, 1 teaspoon Vanilla. Bake @ 350 degrees for 20-25 minutes. I got this recipe from Vicki and they are delicious!! 1/2 cup oil, 1 and 1/2 cups sugar, 1/2 cup cocoa powder, 1 tsp salt, 1/2 cup walnuts-chopped, 2 tsp. vanilla, 2 cups all purpose flour (I used whole wheat flour) 1 and 1/2 tsp baking soda and 2 cups shredded zucchini. �Mix everything together except zucchini and nuts. �Fold in zucchini and nuts. �Bake at 350 degrees unitl done. �Approximately 30 min. �9 X 9 pan makes thick brownies �9 X 13 pan makes thinner. No mistake-this recipe DOES NOT contain eggs. Add 3/4 cup evaporated milk� and mix well.� (I use 1/4 cup� evaporated milk, then add enough water to make 3/4 cup)� Bring to boil 3 cups water.� Add above mixture to boiling water, stirring as you add mix.� When thick add 1 tsp vanilla and�2 tbsp.�butter.� Serve with hot biscuits. 3. Place all the ingredients into a mixing bowl and mix at medium speed until all the ingredients are blended and smooth. 4. Pour into the greased and floured pan and bake for 1 hour, or until done. 5. Frost as desired with your favorite frosting. 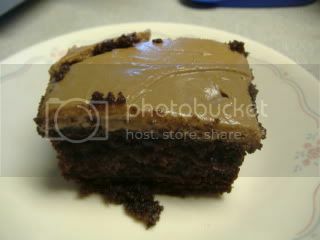 3 1/2 cups powdered sugar, 1/2 cup butter softened, 1 tsp vanilla, 3 tbsp evaporated milk.� Combine all ingredients and enjoy.� I got this recipe from a blog friend https://holcombfamilyrecipes.wordpress.com� I am not a big fan of chocolate but this cake is really good. 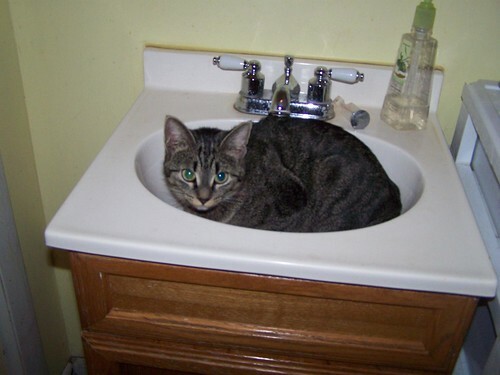 Another picture of Stripes.� Maybe she wants a shower.� Grace took this picture of Stripes in one of her strange places.� She lays in the sink quite frequently.� She also loves to get a drink from the faucet.�� I think the word “spoiled” might come to mind.� Yesterday was lots of fun.� I went to my friend Vicki’s� and we made our own hot cocoa mix.� It is really good.� Much better than the powdered mix bought from the store� and I’m sure much healthier.� We read the ingredients of the store bought instant mix and it contained lots of things we couldn’t pronounce.� In case anyone is interested in making their own here is the recipe.� 16 cups powdered dry milk, 1 1/4 cup cocoa powder, 5 cups sugar, 1/2 tsp. salt.� In a large bowl mix all ingredients well and store in an airtight container or zip lock bags.� To use measure 1/3 cup of mix into a cup and add hot water, stir.� This will make about 1 gal. of mix, perhaps a little over.� Vicki and I halved this recipe.� The powdered milk will be your biggest expense, so shop around for the best price.� I hope you enjoy this as much as we have.� God Bless.